Edinburgh is one of those cities, where we found ourselves just walking around, enjoying the atmosphere and only in the evening did we realize how far we had walked. 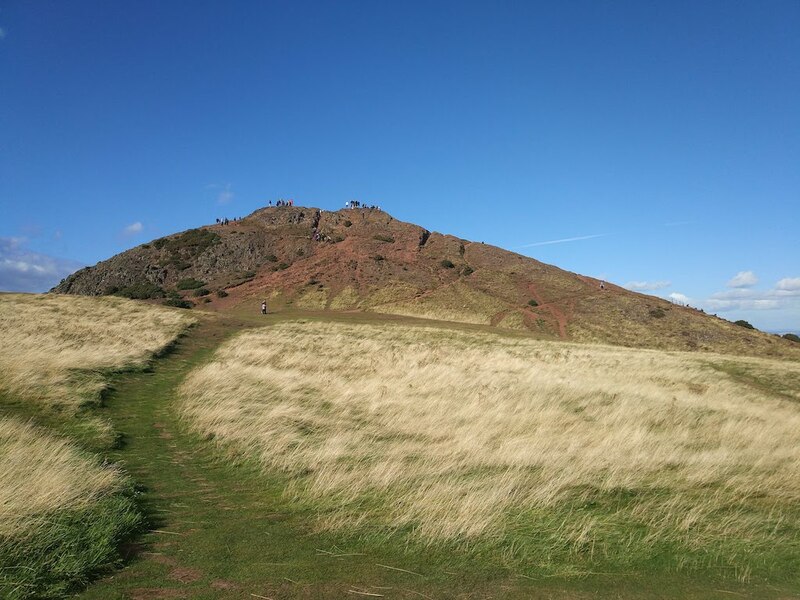 But if you’re looking for a nice stroll away from busy streets like the Royal Mile, here are three of our favourite walks in Edinburgh. This ranks as one of our favourite. It’s a lovely walk or hike, depending on which route you choose, which rewards you with stunning views all the way up. 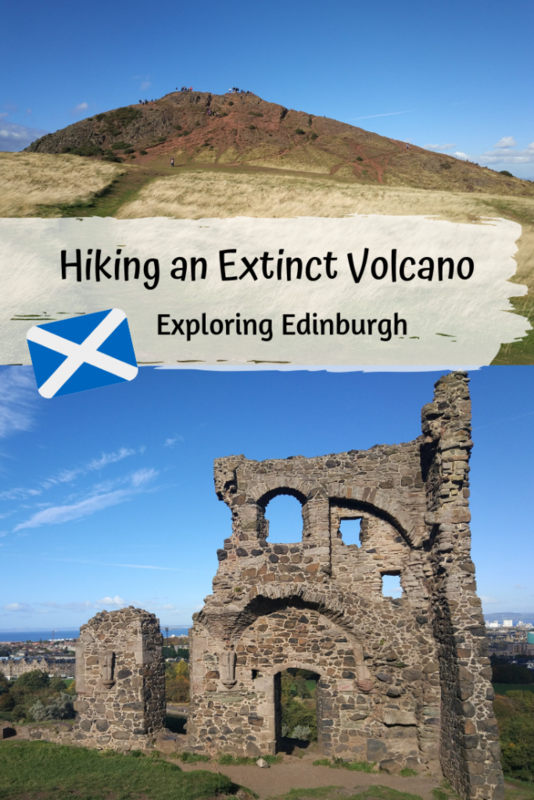 What makes it even cooler is that it’s a former volcano at the bottom of the Royal Mile and therefore, in the middle of the city. There are several paths you can choose. One of the most popular ones you’ll find if you keep walking past the Parliament and Holyrood Palace. It’s marked with signs saying Summit Path. If you’re looking for a less steep path, there’s a shorter easier walk on the other side that will lead you to the bottom of the last stretch to the summit as well. On the way, you’ll find smaller hills hint at the gorgeous views to come and there’s also some ruins like, St Anthony’s Chapel. The final stretch to the summit is a bit rockier, requiring good shoes but the views from the top are worth it. 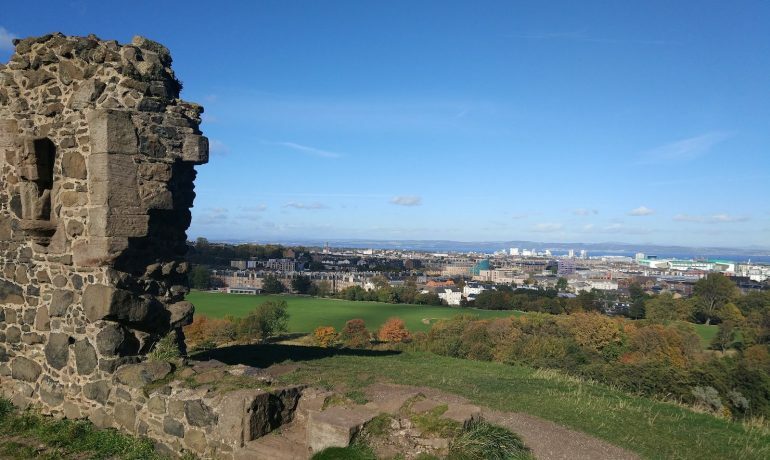 You’ll find a beautiful panorama overlooking the city centre and beyond, the other coast line and more villages in the distance, as well as the Pentland Hills. The volcanic rocks surprisingly had absorbed the sun’s warmth and made a good resting spot, while we caught our breath. Since it was lunch time already, we found a spot admits the tall grass below the immediate summit, which sheltered us from the wind. There we had a little picnic of sandwiches we brought and enjoyed the warm sun on our skins, before descending back to the city. While yes, there may be many people on this walk unless you choose one of the more difficult or round routes, it’s easy to find a quiet spot and enjoy the gorgeous panorama views. Our original plan was to follow the Waters of Leith walk for longer but the risk of a mudslide prevented us. Therefore, we turned it into a walk around Dean Village. We walked up to the Scottish National Gallery of Modern Art and through Dean Village’s graveyard. The details on the Victorian graves amazed us, so gratuitous and yet the artwork was so impressive. At the foot of one grave there was even a small stone sculpture of a lion. From there we were able to join the Waters of Leith walk, following the raging river. The scenery, including the architecture grows more beautiful and quaint, at the same time as the amount of tourists do. 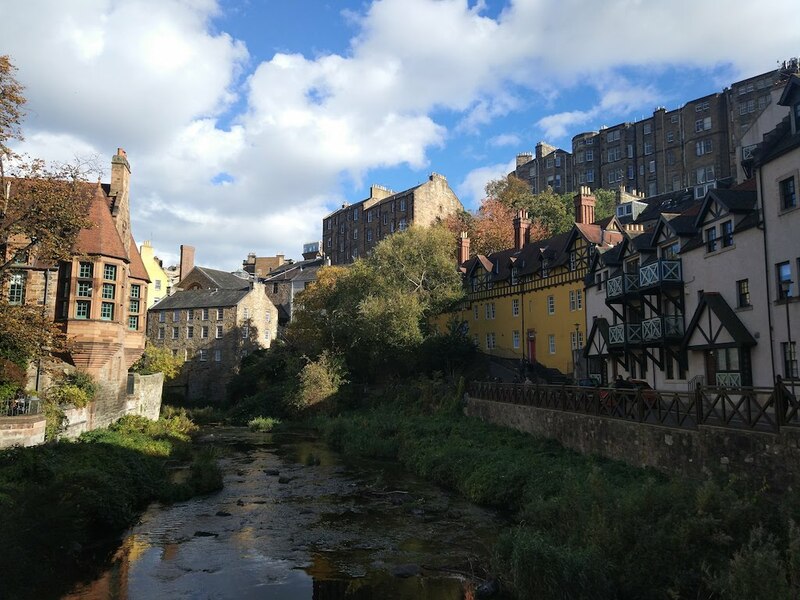 If you want to enjoy a quiet stroll, we’d recommend going early or following the Waters of Leith path much further town, away from the city centre. But in spite of the amount of other people being there, it’s an enjoyable riverside walk which makes you forget how close you are to the city centre until you walk up a flight of stairs and find yourself again admits the bustling city. Perfect for finding a café to rest and recharge. Yes, this is one of the most touristy places out there but who doesn’t love the National Monument’s Greek style outline with the backdrop of panoramic views of the city. Of course, as always with Edinburgh, if you want to take pictures there undisturbed, be very early. 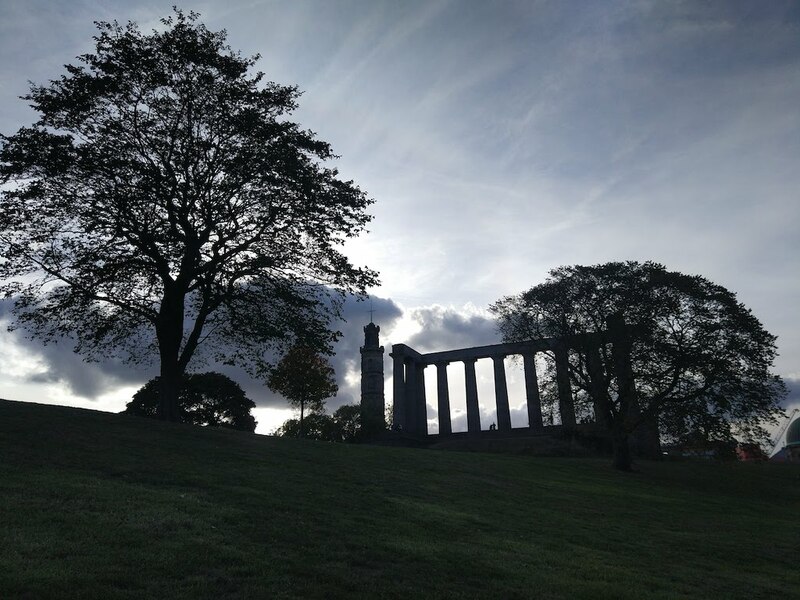 This is where you can attempt to snap one of Edinburgh’s most iconic views but honestly, also looking out onto the other sides of the city may offer even more spectacular views, and perhaps less people standing around, blocking your view.